Firstly, this is how it looks. 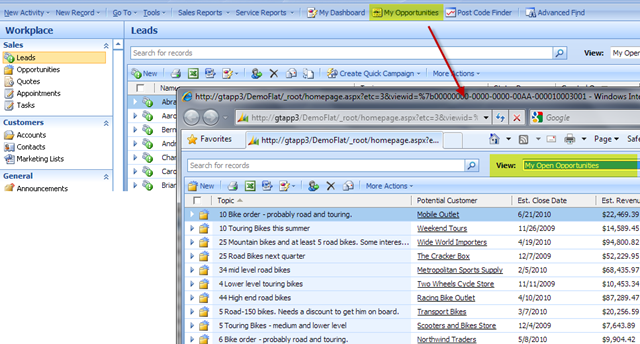 I’ve added a “My Opportunities” button to the CRM toolbar. When clicked, a new Internet Explorer window is launched displaying the Opportunity entity, and specifically, displaying the My Open Opportunities view. Not only have I given my users a 1-click navigation solution but I have also given them a way of launching this key view in a separate window where it can remain open and easily accessible whilst they jump around between other entities back in the main CRM window. This works in the Outlook client and the web client, but the gains are probably felt more when using the Outlook client as you no longer ‘lose your place’ as you flick back to your Inbox or over to your Calendar. This sits under the <ToolBar> node. The Button Icon attribute defines the relative path to the button’s image file. You can create you own image files and point to those but I find you can normally find something useful in the _imgs folder on the CRM server. Quick and easy, but makes CRM just that little bit more enjoyable to work with. This entry was posted in Uncategorized and tagged 4.0, button, crm, toolbar, user experience on March 13, 2010 by Gareth Tucker.